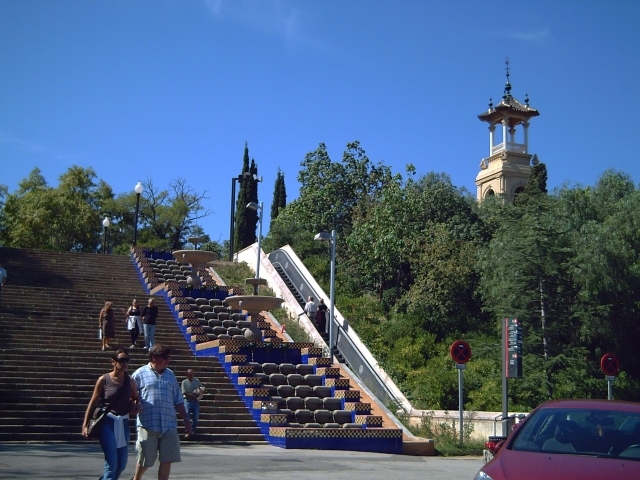 Once you take the elevators and get just below MNAC and Palau Nacional, follow the Passeig de les Cascades, that is, the path to your right or left and you will reach these recently restored staircases adorned with beautiful fountains and blue tiles hidden under the shadow of the trees. You will be really walking along the historic Eix dels Muntanyans (Mountaineers Axis or Way) built during the 1929 Barcelona International Exhibition and the first transversal avenue communicating palaces located East with western areas of the park and Poble Espanyol. So, where were we?, oh yes, I remember now, if you choose the left path, and you keep on going till the end you descend to carrer de Lleida where Teatre Lluire is (a coming post). 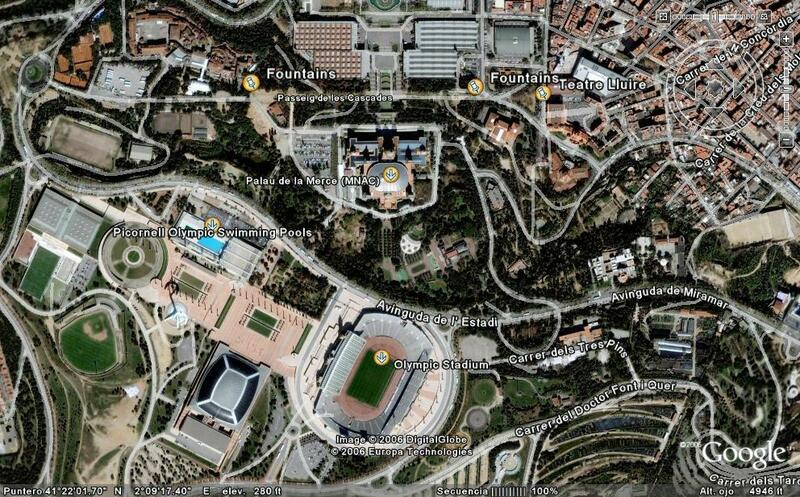 Taking the opposite direction will lead you up to Montjuic Olympic Ring. Here is a wider picture including some more people. It was hard to decide which one to post so I included three photos. 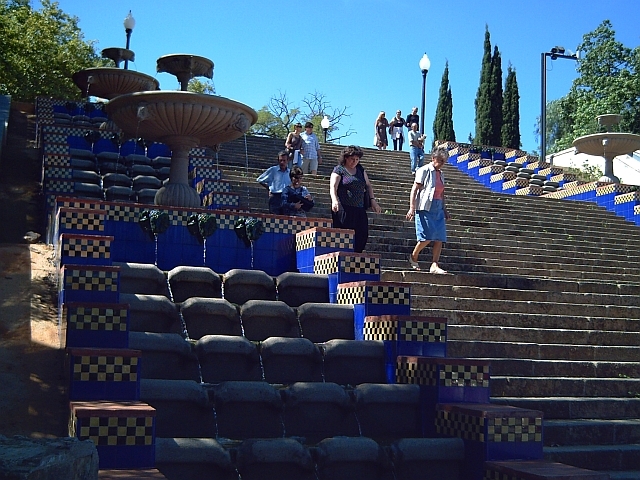 The last one, is taken from the distance where you can better appreciate the staircase. Aerial Picture of Fountains at Montjuic in Barcelona, Spain. If you are traveling to Barcelona soon or you are already in the city, try this fantastic list of Popular Things to Do in Barcelona provided by Virtual Tourist. Anything from Casa Mila to Barri Gotic or from Joan Miro to Nou Camp, you name it, concise and image illustrated. Wow! Something I didn't see when I was in Barcelona. Thank you Carlos! The last 2 panoramic shots are spectacular! Comment: If anyone can´t comment here because he/she is a betablogger and weird things happen, please send me an email to find out a solution. I know that for non-beta users unable to comment beta ones, the way out is clicking "preview" first. Please exchange your experiences.